Junjira Konsang / EyeEm/ Getty Images. The best approach to controlling fleas is to start with the least toxic and most natural choices, resorting to stronger measures only if reasonable control is not achieved. As a prerequisite to any flea-control program, I recommend building up your animal's health and resistance as much as possible through a healthy diet and lifestyle. Along with that, it's important to practice thorough sanitation and cleaning. Understanding the life cycle of the flea makes it clear why cleaning is so important. Adult fleas live about three to four months. During that time they are steadily laying tiny white eggs on your pet that look like dandruff or salt crystals. Flea eggs hatch out into larvae that live in the cracks and crevices of rugs, upholstery, blankets, floors, sand, earth, and the like. Because these tiny larvae cannot jump or travel very far (less than an inch), they feed on the black specks of dried blood ("flea dirt") that fall off along with the eggs during grooming and scratching. After one to two weeks, the larvae go through a cocoon stage (pupa). A week or two later, they hatch out as small fleas that hop onto the nearest warm body passing by (usually your pet -- sometimes you! ), bite it for a meal of blood, and then start the whole process all over again. This cycle takes anywhere from 2 to 20 weeks, depending on the temperature of the house or environment. During summer -- flea season -- the entire cycle is usually just 2 weeks long. That's why fleas increase so rapidly at that time. The bad news is that, no matter how many adult fleas you manage to kill, numerous future fleas are developing in the environment simultaneously. The good news is that these eggs, larvae, pupa, and the flea dirt they feed upon can be sucked up by a vacuum cleaner or washed away in the laundry. And because the developing fleas are so immobile, they are most concentrated wherever your pet sleeps, so you know where to focus your efforts. Your important ally in the battle against fleas is cleanliness, both for your pet and your home, particularly in your pet's sleeping areas. 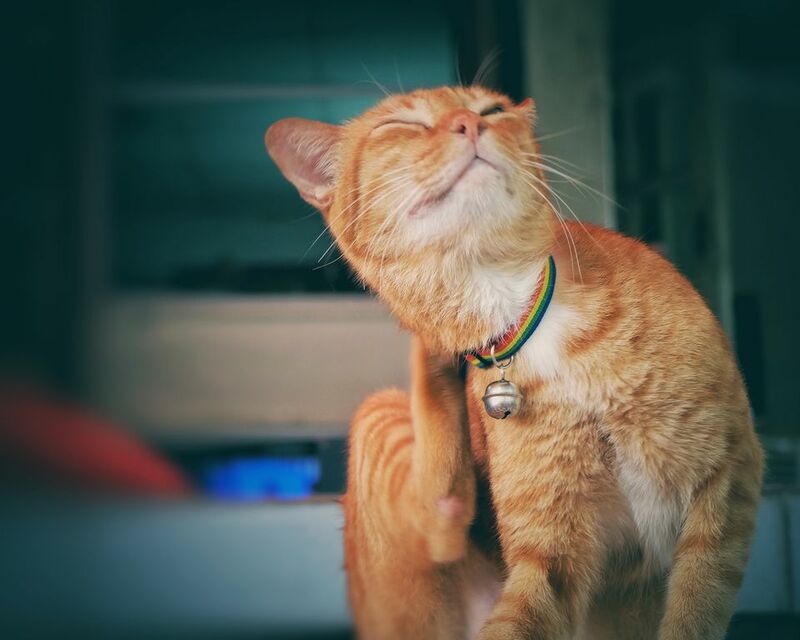 Regular cleaning interrupts the life cycles of the fleas and greatly cuts down on the number of adult fleas that end up on your pet, especially if you act before flea season begins. So start your program with these nontoxic steps. Steam clean your carpets at the onset of flea season (or whenever you begin your flea-control program). Though it is somewhat expensive, steam cleaning is effective in killing flea eggs. Gently but thoroughly comb as many areas as your pet will allow, especially around the head, neck, back, and hindquarters. As you trap the little buggers, pull them off the comb and plunge them into a container of hot, soapy water (or dip the comb and pull the flea off underwater). Cover your lap with an old towel to catch extra clumps of hair and flea dirt and to wipe the comb off as you work. Mow and water your lawn regularly. Short grass allows sunlight to penetrate and warm the soil, which kills larvae. Watering drowns the developing fleas. Encourage ants. Perhaps I should say "do not discourage ants." They love to eat flea eggs and larvae. This is another reason not to use pesticides that kill all the insects in your yard. "Sterilize" bare-earth sleeping spots. If your pet likes to sleep or hang out in a certain bare or sandy area, occasionally cover the spot with a heavy black plastic sheet on a hot, sunny day. Rake up any dead leaves and other debris first. The heat that builds up under the plastic does an excellent job of killing fleas and larvae. Of course, this is not appropriate to use where you want to preserve live grass or plants. Apply agricultural lime on grassy or moist areas. This helps to dry out the fleas. Rake up any dead leaves and grassy debris first. Along with the above steps, you might try these methods to repel fleas that may try to jump back on your pet, especially those harder-to-kill ones hanging out in the backyard. Use an herbal flea powder. You'll find them in pet stores and natural food stores, or you can make your own. Combine one part each of as many of these powdered herbs as you can find: eucalyptus, rosemary, fennel, yellow dock, wormwood, and rue. Put this mixture in a shaker-top jar, such as a jar for parsley flakes. Apply the flea powder sparingly to your pet's coat by brushing backward with your hand or the comb and sprinkling it into the base of the hairs, especially on the neck, back, and belly. To combat severe infestations, use several times a week. Afterward, put your animal friend outside for awhile so the disgruntled tenants vacate in the yard and not in your house. Some herbal flea powders also contain natural pyrethrins, which are not strong flea-killers but do seem to greatly discourage them. Use an herbal flea collar. These are impregnated with insect-repellent herbal oils. Some are made to be "recharged" with the oils and used again. Buy them at natural food stores. Try a natural skin tonic. The animal herbalist Juliette de Bairacli-Levy recommends this lemon skin tonic, which many of my clients successfully use on their pets for a general skin toner, parasite repellent, and treatment for mange. Thinly slice a whole lemon, including the peel. Add it to 1 pint of near-boiling water and let it steep overnight. The next day, sponge the solution onto the animal's skin and let it dry. You can use this daily for severe skin problems involving fleas. It is a source of natural flea-killing substances such as d-limonene and other healing ingredients found in the whole lemon. Add ample nutritional or brewer's yeast and garlic to the diet. Some studies show yeast supplementation significantly reduces flea numbers, though others indicate no effect. My experience with using yeast is that it has some favorable effect, particularly if the animal's health is good. You can also rub it directly into the animal's hair. Many people also praise the value of garlic as a flea repellent, though so far studies do not support this. If these methods do not control the fleas sufficiently, take the following steps. Get your carpets treated with a special anti-flea mineral salt. There have been some developments in safe flea control. My clients report success with a service that applies or sells relatively nontoxic mineral salts for treating carpets. (Fleabusters is the company recommended.) Effective for up to a year, the products safely kill fleas and their developing forms over a few week's time. Once or twice a year, sprinkle natural, unrefined diatomaceous earth along walls, under furniture, and in cracks and crevices that you cannot access with a vacuum. This product, which resembles chalky rock, is really the fossilized remains of one-celled algae. Though direct skin contact is harmless to pets and people, it is bad news for many insects and their larvae, including fleas. The fine particles in the earth kill insects by attacking the waxy coating that covers their external skeletons. The insects then dry out and die. I do not recommend using diatomaceous earth frequently or directly on your animal -- mostly because of the irritating dust that can be breathed in by both of you. It is also messy. Be careful about breathing it in. Wear a dust mask when applying. It is not toxic, but inhaling even the natural, unrefined form of this dust can irritate the nasal passages. Important: Do not use the type of diatomaceous earth that is sold for swimming pool filters. It has been very finely ground, and the tiny particles can be breathed into the lungs and cause chronic inflammation. Use a spray or powder containing pyrethrins or natural pyrethrum. These are the least toxic of all the insecticides used on pets, and they are found in both conventional and natural flea-control products. For a more lasting effect, use a microencapsulated product, which is perhaps labeled "slow release." Repeat the applications as you simultaneously use the carpet treatment system or diatomaceous earth. This will help kill both adult fleas and developing fleas at the same time. Reprinted from: Dr. Pitcairn's Complete Guide to Natural Health for Dogs & Cats by Richard H. Pitcairn, D.V.M, Ph.D., and Susan Hubble Pitcairn (September 2005;$18.95US/$25.95CAN; 1-57954-973-X) Copyright © 2005 Richard H. Pitcairn, D.V.M., Ph.D., and Susan Hubble Pitcairn. Permission granted by Rodale, Inc., Emmaus, PA 18098.